We and our children are in great danger at this time. Our homes, schools, workplaces, automobiles, and more are now swimming in a field of noxious radiation-emitting devices. These devices include cell phones, smart meters, laptops, wifi routers, televisions, cordless phones, baby monitors, microwave ovens, GPS devices, and much more. Ultrasound and all other radiation‑emitting medical devices are part of this toxic grid. All of these technologies have the potential to alter our neurology, change our thoughts and behavior, and ultimately lead us to our demise. It is beyond the scope of this book to go into detail about the weaponized nature of this radiation-emitting grid. However, a short quote from Nikola Tesla provides insight into its true purpose. What is imperative for us to understand now is that, despite the lies we have been fed by the medical-military-radiation complex, at every level and at all times, exposure to manmade radiation is harming us. Manmade radiation has very serious deleterious effects on all life forms and if we allow the current situation to continue, it has the potential to destroy entire genetic bloodlines and the ability of Earth’s children to procreate and/or produce healthy children of their own. 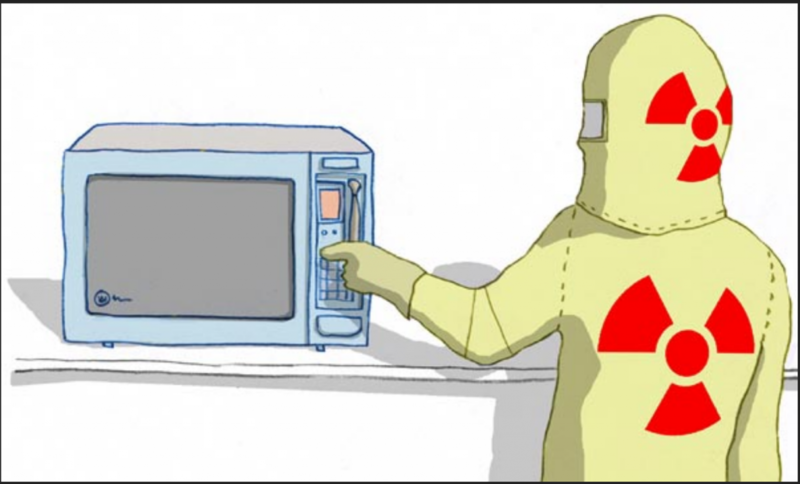 Microwave ovens, for example, utilize non-ionizing radiation for the heating of food. Similar to the way piezoelectric crystals violently shake and vibrate when electricity is applied to them, microwave ovens violently shake and vibrate the water molecules in our food, causing the emission of radiation. The violence that is inflicted on the water molecules in the food changes the molecular structure of the food as well as the blood chemistry and bodily functions of humans that eat microwaved food. The above description sounds almost identical to what is happening to crystals when they are forced to endure being shocked with opposing electrical forces for the creation of ultrasound. Friction from violence, molecules being torn apart and forcefully deformed, reversal of electrical potentials, etc. – all of this is life‑destroying science with potentially lethal effects for Mankind and other life forms. In fact, microwaves are used in the field of gene altering and the genetic modification of mammals, including humans. Microwaves are used to weaken cell membranes and break cells apart. Interestingly, ultrasound is being used for the very same thing! It is being used to deliberately weaken cell membranes (for example, weakening the blood brain barrier for purposes of toxic pharmaceutical delivery) and in the field of gene alteration such as for the process of “gene transfection” which involves the genetic modification of mammalian (including human) cells through the insertion of alien DNA and RNA. Ultrasound “enhances” this satanic process by making cells more permeable to foreign genetic material. Violent cavitation events can occur in liquids that are exposed to RF/EMF/microwave or ultrasonic frequencies. These cavitation events are occurring in microwaved foods as well, which is part of what makes these foods highly toxic. “Did you know that heating water in the microwave can actually be dangerous? This is not an experiment, but rather a warning to help you avoid a potential disaster. The American Burn Association (ABA) has identified scald burns from superheated liquids in microwaves as a target for a new public awareness campaign… “Water alone should never be heated in a microwave.” Here’s why… This is an all too common example of what can happen. A man decided to have a cup of instant coffee, so he heated a cup of water in the microwave. When the timer went off, he removed the cup from the microwave and noticed that the water had not boiled. Microwave “superheating” sounds very similar to the 8500°F cavitational implosions that are sometimes generated by ultrasonic irradiation. These extremely volatile, unnatural forces contribute to the damaging effects that microwave cooking has on human health. ▪ “Eating food processed from a microwave oven causes permanent brain damage by ‘shorting out’ electrical impulses in the brain. ▪ The prolonged consumption of microwaved foods causes cancerous cells to increase in human blood. Moreover, these foods cause stomach and intestinal cancerous growths (tumors). This may explain the rapidly increased rate of colon cancer in America. ▪ Minerals, vitamins, and nutrients of all microwaved food is reduced or altered so that the human body gets little or no benefit. ▪ Regular consumption of microwaved food causes immune system deficiencies through lymph gland and serum alterations. An X-ray in the abdominal area, where it really hits the major blood-forming organs of the pelvic arch, ages us at the rate of about one rad, one year. One spinal X-ray is about one rad, and that’s equivalent to one-year natural aging for increasing your leukemia rate. If the radiation is chest area or even upper thigh, one rad is about six-tenths of a year. You’re not hitting as much of the bone marrow, apparently. Then I learned that if you had dental X-rays, and X-rays of arms and legs, which are again less bone marrow exposure, one rad was equivalent to about a quarter of a year. Indeed, people have a right to know. But we have been consistently lied to by the medical-military-nuclear complex that is wholly responsible for exposing billions of living organisms, including humans, to extremely harmful, manmade radiation. Even though Rosalie Bertell was speaking about “ionizing” radiation, in fact, technologies that utilize “non-ionizing” radiation are producing the exact same effects. All of these radiation-emitting technologies are interfering with the electromagnetic signaling that animates life and this, in turn, is having a deleterious effect on the human heart and much much more. Smart meters, which utilize continuous pulsed electromagnetic radiation, cause the same problem. Obviously, these technologies are a threat to life and things are about to get even more serious. The powers-that-shouldn’t-be are now discussing increasing the frequencies used in microwave ovens from 2.4 GHz to 30 GHz (30 billion hertz). 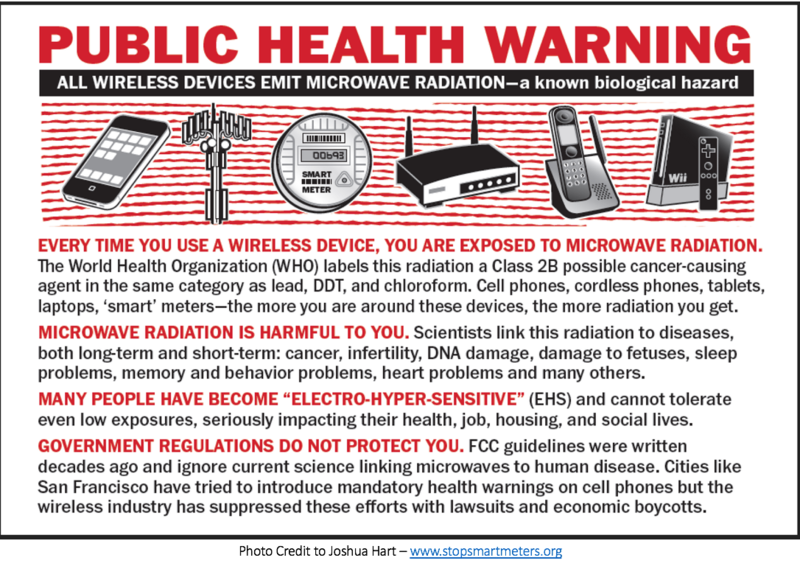 Having just learned that frequencies of 2.4 GHz can cause heart problems and rapid aging syndrome, it is not hard to imagine that 30 GHz of microwave frequency is going to cause serious harm. Keep in mind that microwave ovens, along with ultrasound and the first atomic bomb, were initially created around the time of World War 2 as part of an arsenal of war technologies. These dangerous (and sometimes lethal) technologies are deeply interconnected and we will discuss this in some detail in Volume II of this series when we cover ultrasonic weapons and the history of ultrasound. Since WW2 and the “birth” of these radiation-emitting technologies, there has been an ever-increasing amount of manmade radiation being deployed against Mankind and other life forms. In fact, we are now surrounded by an entire grid of radiation-emitting technologies such as cell towers, wifi routers, cell phones, wifi TV, microwave ovens, GPS devices, RFID chips, broadcast antennas, satellites, smart meters, HAARP, medical radiation including ultrasound, and much much more. Even baby monitors are part of this weaponized grid and we had better get hip to this very quick or all life on this planet will be in serious jeopardy.